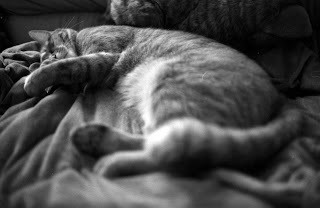 This photo of kitty sleeping, close up at about .6m, was taken with a Konica Hexar AF wide open at F2, and close up. The interesting thing about the photo is that I used C41 color film - Fuji Reala 100, but developed it with b/w Kodak d76 developer for about 11 minutes at 74 deg. F. Scanned in RGB at 24-bit, 2400dpi, with low unsharp mask on an Epson flatbed scanner. Handheld photo taken with a Lumix FZ-3 digicam with image stabilization, at 1/60th, f2.8, and ISO 80. Approximately 8 feet away, with 35mm equivalent focal length of ~300mm-400mm. 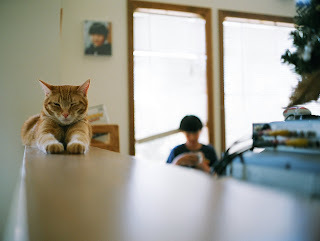 Taken with a Konica Hexar AF at F2 or F2.8 with Fuji Superia 400 film. 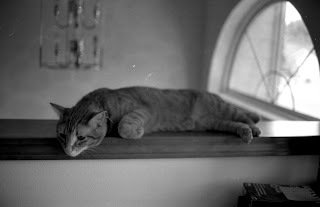 Kitty sleeping in one of his favorite spots. He can balance well in his sleep. Taken by Meg with a Canon A550 at 1/6th, f5.5, ISO 80, 35mm equivalent of ~100mm. Dark to light clouds over the neighbors houses. Taken with a Panasonic Lumix FZ3 at 1/1000, f5.6, ISO 80.